What are the Cops Allowed to Search in Florida? As an American citizen, you must know your rights when it comes to search and seizure. To search you or your property, generally, the police must have a warrant with them. However, warrants are not necessarily needed during traffic stops. This exception applies to your car and motor homes. During this kind of situation, a probable cause is enough reason for a police officer to search you and/or your vehicle. What is a Probable Cause? 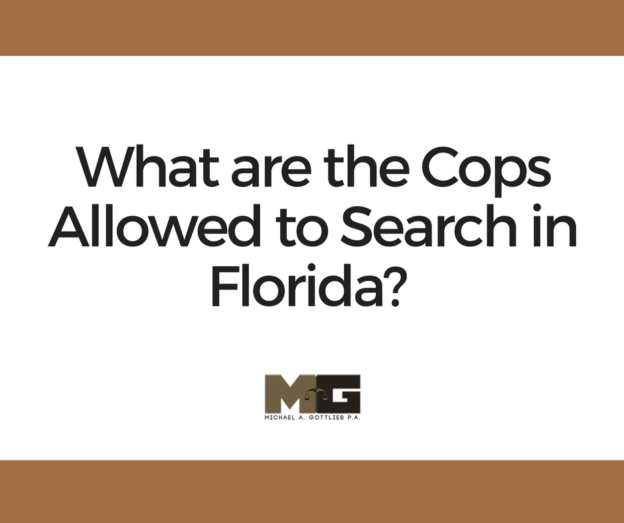 Any real circumstance that the police officer had observed to make him or her believe that a criminal activity is happening or has happened is probable cause that allow them to search you in Florida. An example of a probable cause is when an officer sees or smells contraband. Hearing a confession of guilt for a crime is also a probable cause. With probable cause, a police officer who stopped you can actually search you and your car. However, remember that they can only search parts of your car that can logically hide the suspected contraband. For example, if the police officer has probable cause to believe that you have cocaine in your car, they can go ahead and search all parts of your vehicle. This is because the said contraband can be hidden in any part of the car, including a purse. It is not the same if, for example, the police officer believes that you are carrying a rifle in your car. The officer is not allowed to search for contraband inside a purse as the latter would be too small to hide the rifle. You must always remember that it is your right to not give the officer a consent to search your vehicle. As he is the only one who can do this, the driver of the car in question can refuse to let the officer search the vehicle. Do not panic if an officer stops you on the road and asks, “Do you mind if we search your car?” If the officer asks for your consent, determine first if there is a probable cause for the search. Remember that a police officer has no right to search your vehicle without probable cause. If there is none, under Florida Law and the Federal and Florida Constitutions, the police officer must let you drive on. Pull over immediately when the police flag you down. Once you have parked your car on the side of the road, keep your hands on the wheel where the officer can see them. Unless they request to see your paperwork, do not reach for anything, anywhere. Like any other person, police officers should be treated with kindness and respect. Greet them with “Good day, Officer,” when pulled over. Never talk back to an officer. Do not raise your voice or use profanity when talking to them. Showing any kind of hostility to an officer is dangerous and can lead to unnecessary trouble. Remember that you always have the right to say no to a police officer who is asking for consent to search your car. Say no respectfully, but firmly. The 4th Amendment gives you the right to refuse search consents. Saying no to a search request is not admitting you are guilty of any crime. If you think you are being harassed or a police officer is abusing their power on you, having witnesses and evidence will help you in court in case a criminal charge is filed against you. Ask if you are free to go. Do not wait for the officer to tell you that you can go. If you think everything has been cleared, ask the officer politely if you are free to go. If the officer’s answer is vague, ask the question persistently. If you are not free to go, and are being detained, remain silent and ask to see your lawyer. If you believe you are being searched without probable cause and your right to the 4th Amendment is being compromised, call an attorney as soon as possible. Seek for legal advice from trusted and experienced attorney in your area. Michael Gottlieb can be your criminal defense lawyer in Broward.